Having risen from its humble beginnings 20 years ago to being one of the phenomenal success stories in the regional manufacturing and industrial sector, Emirates Glass has come a long way. Established in 1998 in Al Quoz Industrial Area in Dubai in response to the rapid growth of the local construction industry, Emirates Glass – in this two-decade long journey – has emerged as one of the leading processors of flat architectural glass in the Middle East, with a rapidly growing market – from the UK, mainland Europe, Russia and Singapore. In its 20th year, the company, part of holding company Glass LLC and subsidiary of Dubai Investments (DI), is aiming to reinforce its growing reputation in markets across the globe by enhancing its production and products; expanding market share and targeting acquisitions. “Emirates Glass is aggressively aiming at increased market share in existing and new geographies during 2018 and beyond. 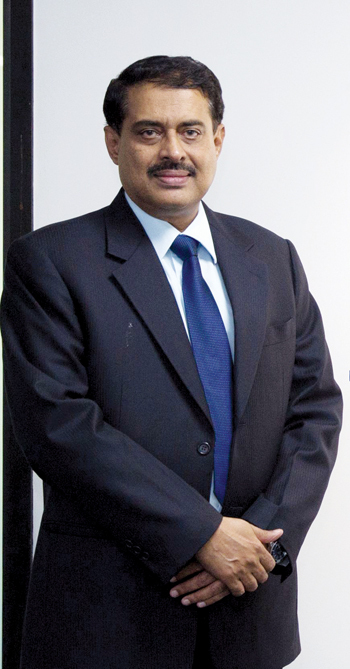 Going forward, Emirates Glass also plans to acquire processing units in the GCC region,” Emirates Glass’ executive president, Rizwanulla Khan told the Gulf Industry in an exclusive interview. As a step to continue its growth trajectory in the years to come, the company is planning to upgrade its plant and introduce new machinery which will enable it to process jumbo-size insulating glass (IG) units and optimise the production process. Towards this, Emirates Glass, this year plans to introduce the Ceramic Frit Machine – Jumbo size lamination and Jumbo Double Glazing Line, to enable it to remain on top of the glass processing across the Middle East. The company has also unveiled Lumiere Series, Jumbo autoclave machines, sand blasting machine as part of its futuristic growth plans. “Given the company’s emphasis on keeping up-to-date with customer needs and the technological advancements that take place within the glass industry, Emirates Glass is committed to upgrade the plant with high-efficient machines that increase production capacities,” said Khan. According to him, Emirates Glass has implemented a continuous development strategy for glass products and coating to make its business more effective, streamlined and profitable. The production goals achieved in 2016 and 2017 were in line with the demands of the various projects undertaken in the UAE and region, he said. “The new product/ technology at Emirates Glass includes machinery to process jumbo size insulating glass (IG) units, the Lumiere series, which offers a range of laminates, interlayers and inserts that increase performance and create fascinating visual effects,” he explained. Over the years, the technology upgrade includes installation of the Terra G coating line (2009), upgrade of Terra G (2015), new SuperLite coatings (2016), and launch of 73 different coating products. 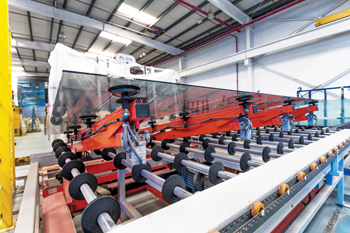 Additionally, Emirates Glass has the largest tempering machines in the region. The new products introduced include Lumiere Series, fire-rated glass and bullet resistant glass. “The goal of Emirates Glass is not only provide the full range of high performance large glass panels, but also guarantee the highest quality standard available in the glass world,” he added. As the leading supplier of sputter-coated energy saving glass across the Gulf, with presence in markets across the globe, Emirates Glass currently operates a 60,000 sq m production facility in Al Quoz industrial area and a 32,825 sq m post-temperable glass coating line in Dubai Investments Park (DIP) since 2010. 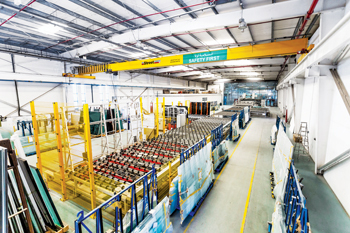 Starting from a manufacturing unit with a six-cathode coating line, a loading bed of 2440 mm x 3600 mm and an annual coating capacity of 750,000 sq m of sputtercoated glass, Emirates Glass has now advanced to a 20-cathode line, a loading bed of 3000 mm x 6000 mm and an annual capacity of 3,500,000 sq m of Magnetron Sputtering Vapour Deposition (MSVD) sputter-coated glass. To meet the challenges of a rapidly growing market, Emirates Glass also increased its capacity in glass tempering, double glazing and cutting processes, thus catering to the demand for highly complex glass types, now commonly used at airports, shopping centres and hotels. At the heart of this is the manufacture of MSVD high performance glass under EmiCool range, designed to minimise solar heat gain into air-conditioned buildings, particularly in the Gulf region. Over 60 per cent of Dubai is currently glazed with EmiCool energy saving glass products. The product range includes EmiCool Classic, EmiCool Sun, Emicool Plus and other spectrally selective products. The company has achieved strong growth since its inception in 1997, with assets and sales consistently surging over the years. According to Khan, the company’s assets have grown from Dh 58.7 million ($15.98 million) in 1997 to Dh 261 million ($71.06 million) - as of November 2017. The sales have also grown consistently, backed by mega project wins in the UAE and Gulf and it is currently executing projects worth Dh 100 million ($27.22 million) in the UAE and region. The company has also consistently expanded its product range in line with market needs and demands as part of its futuristic growth plans. Sales have grown year-on-year (yoy), increasing every year by approximately 30 per cent, which have positively impacted the net profit of the company, Khan said while commenting on the performance in terms of net profit in 2016 and in 2017. “The sales and new projects for Emirates Glass are a testimony to the growth potential of its high-quality, energy-efficient products. The company has an excellent portfolio of projects in the Gulf region and beyond, which has cemented its credibility as a trusted supplier of glass products in the region and overseas,” he added. Exports form a large chunk at Emirates Glass: nearly 30 per cent glass from the 1.4 million sq m coated glass annually manufactured at Emirates Glass is exported. The company, which was created to cater to the local market demand, currently exports to more than 20 countries, including the UK, Canada, Australia, Singapore, South Africa, Lebanon, Azerbaijan, Turkey, Egypt, Jordan, India, Pakistan, Bangladesh, Sri Lanka, Oman, Saudi Arabia, Bahrain and others. In terms of milestones for the company, Emirates Glass takes pride in the fact that nearly 60 per cent of buildings in Dubai are glazed with Emirates Glass products, reflecting its market reputation and standards. The recent project wins include high performance, energy-saving, reflective coated glass products for the Ministries Complex in Kuwait, the first-ever greenhouse being constructed in Dubai named as The Quran Park, the Enterprise Command and Control Center – EC3 of Roads and Transport Authority (RTA), Dubai and ITCC Tower and Maad Tower in Saudi Arabia. Within the UAE, the company has also won glass contracts for Akoya Villas, Nad Al Sheba Villas, Dubai Hills Villas, Oud Al Mateena Villas, 1017 Yas West, Al Yaher, Tiara United Tower, Suites in the SKAI, Hathboor Tower, Mamsha Al Saadiyat, Adnoc Complex, Manazil Terhab Hotel, Ajman City Center and other developments. The company believes that its technical knowledge is the main strength and its focus is on highlighting this expertise to the architects and consultants in new forms and methods they can use. Furthermore, this know-how, when combined with the resources available in-house in Dubai, is a veritable dynamo of innovation. “Staying up-to-date in an industry that’s constantly shifting isn’t easy, but being aware of changes as they are happening keeps Emirates Glass ahead of the curve,” Khan said. “To be equipped to face industry challenges, opportunities and trends, Emirates Glass first observes the competitors, notices clients and prospects, and then directly speaking to the customers to address their growing needs and demands,” he added.